← Considering buying a business? What size and type business is right for you? Lets suppose you have carefully considered the advantages of business ownership, and decided that you definitely want your own business. You’re ready to start your search for the right business. What’s next? Where do you look to find a business for sale? The first place I’m going to suggest may surprise you. You may never really have thought about it but probably the first place you ought to look is within your own family. Do you have a family member, close or extended, who owns a business? Do you think they might, for one reason or another, consider selling it to you? Are they approaching retirement age? Do they appear “burned out”? Are health problems limiting the amount of time they can devote to the business? Do they want to travel? You never know until you ask. Lets say your Uncle Ben has a convenience store that you might consider operating as your own if it was for sale. Call Uncle Ben and make an appointment. Tell him over the phone that you want to “come by and talk about something important when he has a few minutes.” This puts Uncle Ben on notice that this is not just a casual visit. When you visit your uncle, be completely “up front” by telling him you have decided to go into business for yourself and you were wondering if he “had ever considered selling his business.” Then be quiet and listen. If he has been considering getting out, you may have hit pay dirt. If he is not interested, he may know of other businesses for sale. Or he may actually offer to help finance the purchase of a business when you find one! Stranger things have happened. You can’t lose by talking with him. However, some words of caution are in order when dealing with family members. Don’t take any short cuts just because you’re dealing with family. Go through all the remaining steps that I’ll describe in additional postings on this site. Of particular importance when family is involved, is the “due diligence” phase. Take a hard, critical look at the business just as you would if a complete stranger owned it. Make sure it is the right business for you. Although less productive than it was a few years ago, another place to look for businesses is in the Sunday newspaper. Sunday is traditionally the day that businesses for sale are advertised. 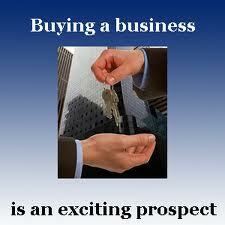 Look under the classifications of “Business Opportunities” or “Businesses for Sale”. Some newspapers have both classifications. Some are pretty “scammy.” There will be ads for vending routes (with grossly overpriced vending machines) and home based businesses including medical billing (with grossly overpriced computer software and no clients). But don’t despair. With just normal smarts, you’ll be able to tell the difference between the “scammy” and the legitimate local businesses that are for sale. One quick way: local businessmen use local telephone numbers, not toll-free ones that are answered half way across the continent. A third place to look for businesses for sale is on the Internet, which is now the most popular venue for business-for-sale searches. Just go to any search engine and enter “Businesses for Sale”. You’ll get hundreds, perhaps thousands of sites. To narrow down the sites to ones you can use, you might want to enter: “Business for Sale in Kentucky” (or whatever state you want). One of the largest and best national sites on the web is www.bizbuysell.com. Another is www.BizQuest.com. An experienced business broker is familiar with the local market and he usually has a considerable number of businesses listed for sale at any one time. He can assist you with everything from focusing your search, preliminary screening of several offerings, visiting the businesses, buyer-seller meetings, cash flow calculations, pricing rationales and strategies, offers to purchase, negotiations, contingencies, and closings. If you choose to use a business broker, plan on spending some time with him. He needs to get to know you and your requirements. And you need to get to know and trust him. To insure that you receive the maximum benefit from his experience, be honest with your broker about your needs. Let him know what kind of income you need and what you have in investment capital. Give him any limiting conditions that will influence your decisions. The assistance of a knowledgeable, trustworthy business broker can be invaluable. He can save you time and money. He can steer you clear of the common pitfalls in the business buying process. And he can make sure you get what you paid for. But as I said above, I’m prejudiced. I’m a business broker! William Bruce is a business broker, an Accredited Business Intermediary and a business appraiser. He may be reached at (251) 990-5910 or by email at WilliamBruce@bellsouth.net. This entry was posted in Buying or Selling a Business and tagged bizbuysell.com, business broker, business for sale, buy a business, Find a small business for sale, small business for sale, William Bruce Sunbelt Business Brokers. Bookmark the permalink.